I don't want you to get me wrong -- I'm not unhappy with ideas that contribute to a broader understanding of the Electric Universe theory. Yes, Birkeland currents exist in space. Yes, most objects exhibit charge-flow characteristics to some extent. 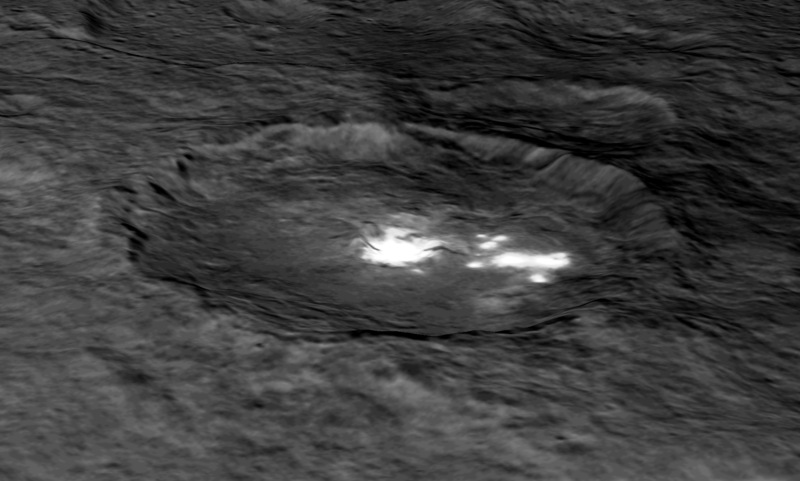 However, considering Ceres, those phenomena have to be taken in context. Does Ceres possess a magnetosphere? No. Also, no detectable magnetic field. It's unlikely that there's enough charge density accumulation from a few hydrogen nuclei per cubic meter, especially since Ceres is composed of dielectric insulators. A major tenet of Electric Universe theory is that the Solar System was chaotic a few thousand years ago. The features on all the moons and rocky planets are forensic evidence for that idea. How many thousands of years isn't important, since it isn't millions of years or even hundreds of thousands of years. The major premise is that electricity from highly charged celestial objects discharged many times to the surfaces of most Solar System bodies, like Ceres. Steve Smith wrote: I don't want you to get me wrong -- I'm not unhappy with ideas that contribute to a broader understanding of the Electric Universe theory. Yes, Birkeland currents exist in space. Yes, most objects exhibit charge-flow characteristics to some extent. However, considering Ceres, those phenomena have to be taken in context. I get it. I just think that Electric Universe has ample examples of active surface erosion in the now, Io, Enceladus, all spheres are embedded, there is charge throughout the system, like investigators we have to find out what it does, when it does something and how it works physically, i think E/M is not enough, you also need the charge field (ie photons), that is not EU but Miles Mathis, but it is compatible as charge underlies E/M. All spheres (no matter the size since atoms also recycle the charge field) take in charge at the poles and out the equator. Interactions are evidence of this charge field, and the biggest charge field comes from the Sun, it pushes the ions and electrons. Are you forgetting that those objects are within the magnetospheres of gas giant planets? Birkeland currents are also known as "field-aligned currents". There's no field at Ceres strong enough to compress and align the solar wind, since Ceres is not affected by gas giant electric fields. That article has a link to the original Nature article. The bright spots are not ice, they are definitely a reflective powder. I disagree with the evaporating liquid residue theory. This press release is reiterating the haze atmosphere in Occator, although previous posts from the research team indicate that conclusion isn't definitive. Steve Smith wrote: I disagree with the evaporating liquid residue theory. Yes, me too, that is ad hoc. Also they immediately proposed a global ice layer just beneath the crust, no direct evidence for that. Yes, but as I've been saying: not now, many thousands of years ago. You're an EU person, aren't you Steve? Why can't there be any currents active on Ceres now? I would have thought every object within the Sun's electric field, would have active currents. Average values for the solar wind's velocity, density, and magnetic field strength at the orbit of the Earth: 468 km per second; density 8.7 protons per cubic centimeter, and 6.6 nT, respectively. Since there is a 27-fold dilution of the solar wind at Jupiter, one assumes a significant reduction in strength at the orbit of Ceres. I submit that the solar wind is so diffuse that there's no possibility that a Birkeland current with sufficient strength is eroding Ceres. No "sputtering" is taking place. Even as close as Earth orbit, the solar wind doesn't erode craters in the north or south polar regions, where it reaches the ground. Whatever happened to Ceres probably occurred thousands of years ago. Ceres and Vesta are vacuum sealed mausoleums. Ceres is in an orbit just past Mars' arbit. A long way from being out as far Jupiter. Even so, Jupiter is known to be extremely electrically active, as are planets further out, such as Saturn and Pluto. Further to that, NASA has just discovered particles zipping along "roads" and "magnetic highways" way out at the heliopause. Some eight times the distance of Pluto from the Sun. That is, Birkland currents with sufficient strength that even NASA does not deny them. And the luminous spots in Occator crater are continuously changing. They're slightly different again in every photo. Also, if you watched the rotation movie linked above, Occator is not the only active bright region on Ceres' surface. This is just my observation. I don't believe distance is that much of an issue, for things with electric fields the size of the Sun's. comingfrom wrote: Ceres is in an orbit just past Mars' arbit. A long way from being out as far Jupiter. That's correct. When looking at something the scale of a solar system, it's useful to note that electric current via ion conductivity i.e. the 'solar wind' is only a part of the picture. The other part is dielectric induction, the longitudinal ⇆ mode of current. After all, that is what Maxwell's "displacement current" is, and why there are four functions in the Telegraph Equations.